The eye is the organ of vision. The main cells responsible for beginning the process of converting light (of varying wavelengths) into an interpreted image we can ‘see’ are photoreceptors. These cells respond to the stimulus of light and are located in the innermost layer of the eye – the retina. The sclera – The protective, fibrous outer coating of the eye which also helps to maintain the eyeball’s globe shape. The sclera layer also includes the cornea, which helps to focus light onto the retina. Choroid – Darkly pigmented to prevent light escaping the eye, it contains blood vessels which supply all the internal structures of the eyeball. Tapetum Lucidum – A triangular area containing light reflecting cells found behind the retina in some species (e.g. cats); it helps to reflect light back to the retina, especially useful in low light situations. Ciliary body – Contains the smooth ciliary muscles which control lens thickness and shape. 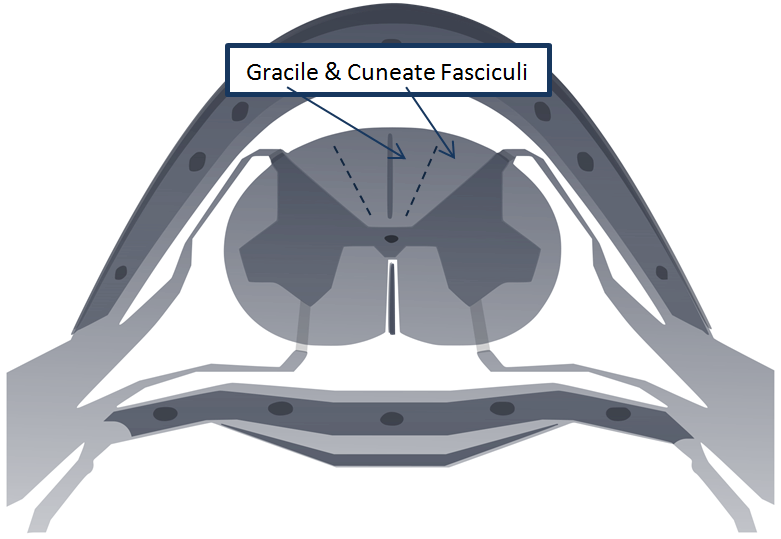 Suspensory ligament – Supports the perimeter of the lens. Iris – Contains radial and circular smooth muscles which control the opening of the pupil to regulate the amount of light entering the eye and to prevent damage. Pigmented layer – Prevents light leaking out from the eye, synergising with choroid of the uvea to produce a greater effect. i. Rods – Sensitive even in low light conditions but they only provide black and white vision. This makes them useful for night vision. High sensitivity, low acuity. ii. Cones – Only sensitive in well light conditions, but they are able to provide colour vision. Low sensitivity, high acuity. Bipolar neurones – Receive the raw information from the rods and cones and transmit this to the ganglion cells. One neurone can serve multiple rods/cones. Horizontal/ Amacrine cells – Located between the rods/ cones and the ganglion cells, they are situated amongst the bipolar neurones. 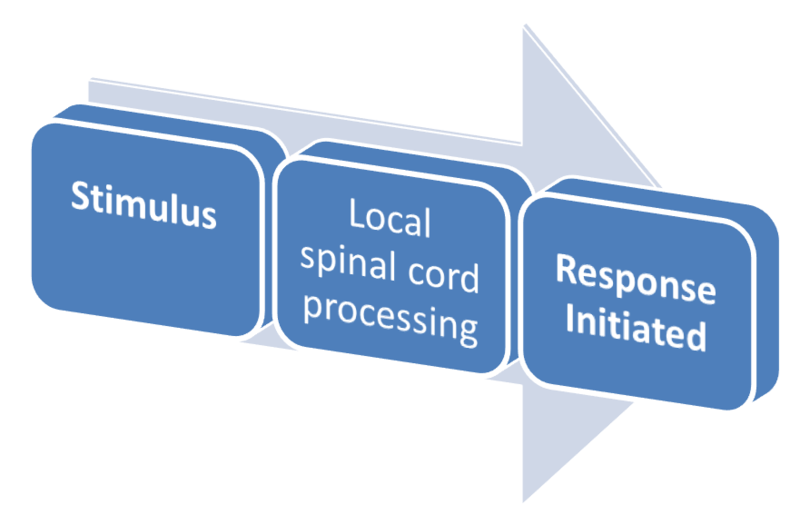 Their role is to integrate the visual information received from the rods/ cones before it is sent to the brain. 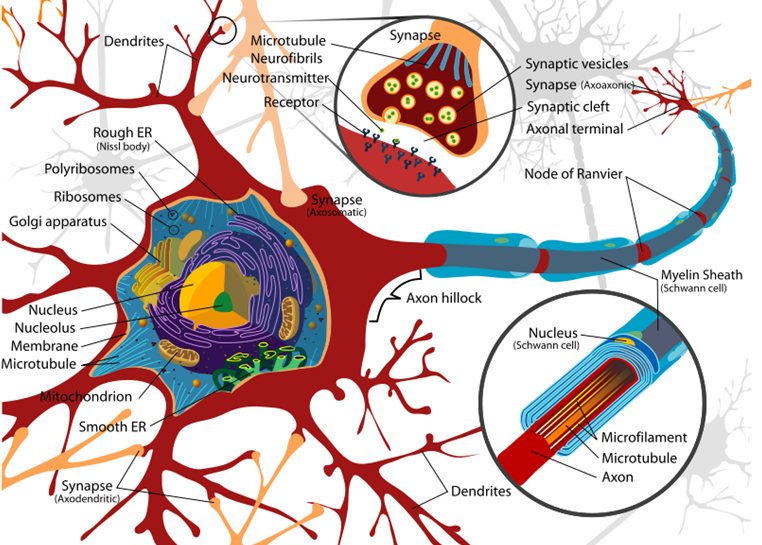 Ganglion cells – Each bipolar neurone synapses with a ganglion cell. 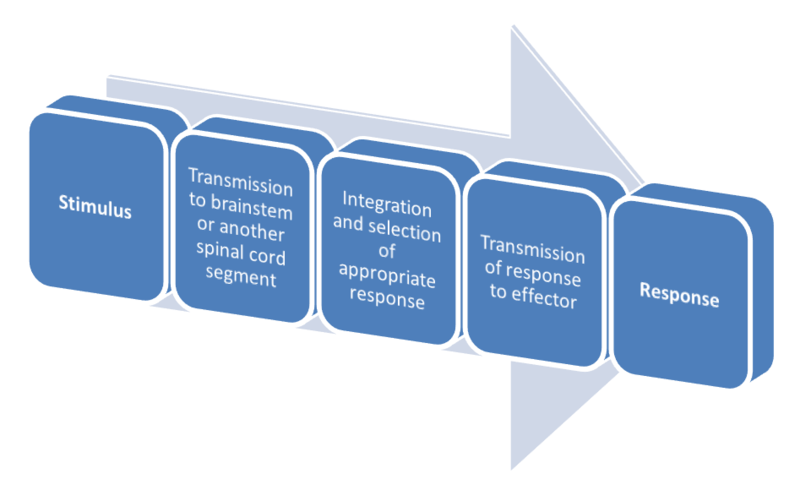 When an action potential is generated from rod/cones stimulation, it is transmitted down the axons of the ganglion cells. Light enters the eye through the cornea, pupil and then lens. The lens focuses the image onto the retina. Photoreceptor cells of the retina are stimulated by the light sending nerve impulses from the rods/cones through bipolar neurones to the ganglion cells. The axons of the ganglion cells travel across the surface of the retina towards the optic disc at the centre of the retina. The nerves from all the ganglion cells bundle together at the optic disc to form the optic nerve (II). There are no rods or cones located on the optic disc. From the optic nerve (II) information is carried to the primary visual cortex of the cerebral hemispheres located at the rear of the brain. This is where the light information is finally interpreted as an image. Pecten – Birds contain an organ within their vitreous humour (the jelly-like substance which fills the eye cavity). It is thought that the pecten both nourishes the retina and controls the pH of the vitreous body. It is present in all birds and some reptiles. Shape – The actual shape of the eyeball itself may vary between species. For example humans have a globe shaped eyeball, whereas horses have a non-spherical, almost cuboidal eyeball. This allows for more than one fovea (the area of the retina which provides maximum acuity). Fovea – As above, the size, shape and number of fovea may differ between species. Pupils – The shape and size of pupils also differs between species. Humans have round pupils, whereas cats for example have pupils shaped as vertical slits. Collie eye anomaly (CEA) – a congenital, inherited, bilateral eye disease of dogs involving the retina, choroid, and sclera. It can be a mild disease or cause blindness. CEA is caused by a simple autosomal recessive gene defect. There is no treatment. Progressive retinal atrophy (PRA) – a group of genetic diseases seen in certain breeds of dogs and more rarely, cats. It is characterised by the bilateral degeneration of the retina, causing progressive vision loss culminating in blindness. The condition in nearly all breeds is inherited as an autosomal recessive trait. PRA can be considered similar to retinitis pigmentosa in humans. Retinopathy – a general term that refers to some form of non-inflammatory damage to the retina of the eye. Cats experience ‘Taurine Deficient Retinopathy,’ a lack of taurine in the diet of the cat leads to the degeneration of the photoreceptors. Cat food is therefore supplemented with taurine. As mention earlier, the photo receptor cells are rods and cones. Cones are associated with colour vision but are not sensitive in low light, whilst rods are – but they have low acuity and provide only black and white vision. The initial steps for photoreceptors in perceiving light requires the use of a chemical called rhodopsin, found in rod cells it can be broken down into the protein opsin and a small molecule retinal (Derived from retinol – vitamin A). Rhodopsin is extremely sensitive to light, enabling vision in low-light conditions. When exposed to light, the pigment immediately photobleaches breaking down into opsin and retinal. The breakdown of rhodopsin causes a secondary messenger cascade (phototransduction) eventually resulting in the information reaching the visual cortex. Photoreceptors in the absence of light release the neurotransmitter glutamate. When light falls on the photoreceptors they stop releasing glutamate. Opsin is a G-Coupled Protein Receptor which spans the membrane of discs located just inside of the rods. When light reaches rhodopsin, it causes opsin to isomerise (change from a cis to trans shape). The now active form of rhodopsin activates a G protein called transducin. The active enzyme phosphodiesterase hydrolyses cGMP to CMP, causing it to detach from the sodium channel, thus the sodium channel closes. As sodium can no longer enter into the rod, the membrane potential decreases to -70mV causing the rod to hyperpolarise. Glutamate is no longer released. Bipolar cells which synapse with the rods may generate an action potential when glutamate is no longer being released across the synaptic cleft. Glutamate may act as either an excitatory or inhibitory molecule to the bipolar neurone which synapses with the rod. This gives rise to ‘on’ and ‘off’ bipolar cells. The ‘on’ bipolar cells are activated by light – therefore glutamate was acting as an inhibitor as glutamates inhibition (caused by light hitting the rod) activates the bipolar cell. The ‘off’ bipolar cells are deactivated by light – glutamate was therefore acting as an excitatory molecule. Light prevents glutamate being released which was stimulating the bipolar cell. Ganglion cells only detect light from a region known as its receptive field. The receptive field is split into the field centre and the field surround. Basically forming two concentric circles, these circles representing regions at which light is detected. With receptive fields alone, images would appear blurry. The process of lateral inhibition aids this process to form sharp images. Lateral inhibition is the ability of a neuron to reduce the activity of its neighbours. In terms of vision this means ganglion cells receiving a moderate or low amount of light (yet still enough to generate an action potential) which contribute to blurry images, can be inhibited by neighbouring neurons which are receiving greater light stimulus. The brain is able to perceive sharper images from this information. It is believed the horizontal and amacrine cells discussed earlier are involved in this process. Horizontal cells being involved in sustained lateral inhibition and amacrine cells believed to be involved with transient lateral inhibition. 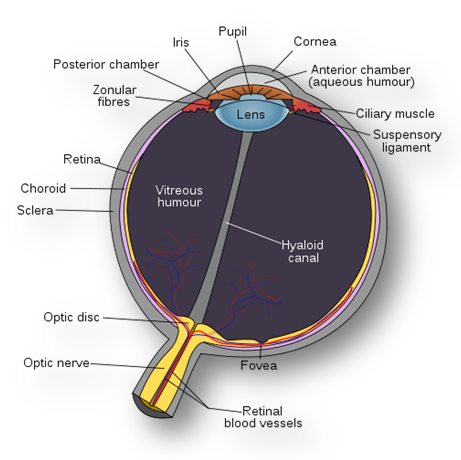 As you know, light enters through the lens and is focused on the retina. From there it is detected by photoreceptor cells which synapse with bipolar cells. These bipolar cells synapse with ganglion cells. The axons of the ganglion cells group together at the centre of the retina to form the optic disc. This goes on to form the optic nerve (II). From the optic nerve (II) the majority of axons are directed to the lateral geniculate nucleus (via the optic chiasm and the optic tract) in the thalamus. The lateral geniculate nucleus (LGN) acts as the primary processing centre for visual information received by the retina. The neurones of the LGN send their axons through the optic radiation to the primary visual cortex. There is a visual cortex for each hemisphere of the brain, both located at the very back of the brain. The left hemisphere visual cortex receives signals from the right visual field and the right visual cortex from the left visual field. Within the visual cortex, groups of ‘simple cells’ (receptive areas) join to form ‘complex cells’ which are able to detect particular shapes. 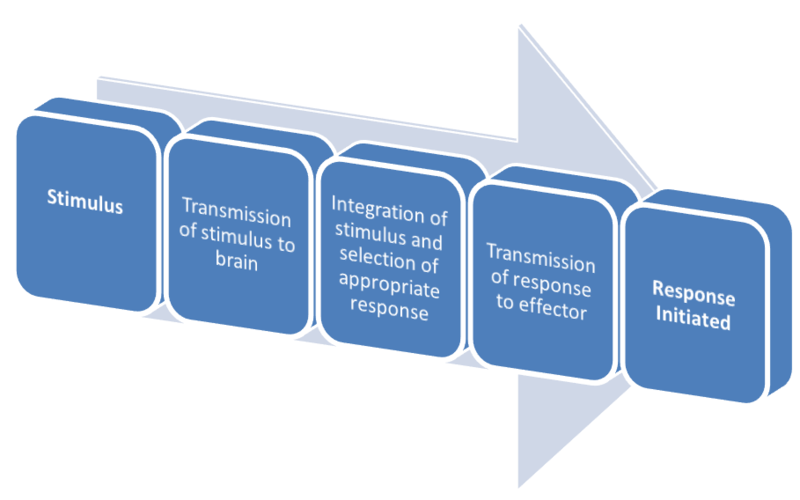 From the visual cortex, information is sent to the cortex in the temporal lobe; here it is connected to a response i.e. recognising a face, performing a task etc. “It was confirmed that suturing the lids of one eye (monocular deprivation), until only 5 weeks of age, leaves virtually every neurone in the kitten’s visual cortex entirely dominated by the other eye. On the other hand, deprivation of both eyes causes no change in the normal ocular dominance of cortical neurones, most cells being clearly binocularly driven. Kittens were monocularly deprived until various ages, from 5 to 14 weeks, at which time reverse suturing was performed: the initially deprived right eye was opened and the left eye closed for a further 9 weeks before recording from the visual cortex. Reverse suturing at 5 weeks caused a complete switch in ocular dominance: every cell was dominated by the initially deprived right eye. Reverse suturing at 14 weeks, however, had almost no further effect on ocular dominance: most cells were still driven solely by the left eye. Animals reverse sutured at intermediate ages had cortical neurones strongly dominated by one eye or the other, and they were organized into clear columnar groups according to ocular dominance. Thus, between 5 weeks and 4 months of age, there is a period of declining sensitivity to both the effects of an initial period of monocular deprivation and the reversal of those effects by reverse suturing.” Blakemore, C., Van Sluyters, R.C. Reversal of the physiological effects of monocular deprivation in kittens: Further evidence for a sensitive period (1974) Journal of Physiology, 237 (1), pp. 195-216. As it states, this shows how important early development of the visual system is. Other experiments have also been conducted, where animals have been brought up in closed environments, which for example contain only vertical lines. After development, when the animal is released from this environment it is not able to process horizontal lines. It is therefore unable to perceive these lines.